On July 26th Our Holy Orthodox Christian Church commemorates the holy Feast of Our Holy Mother, the Martyr Paraskevi (Paraskeva) of Rome. Born in Rome of Christian parents, she was brought up from her earliest youth in the Christian faith and gave herself wholeheartedly to the fulfilling of God's Commandments in her life. She brought others to the Way by means of her true and deep faith and devout life. When her parents died, Paraskevi gave all her goods away to the poor and received the Monastic habit. As a nun, she preached the Truth of Christ with ever more burning zeal, not hiding from anyone, even though the Christian faith was at that time subject to bloody persecution by the pagan Roman authorities. Wicked Jews denounced Paraskevi for preaching a forbidden faith, and she was brought to trial before the Roman Emperor Antoninus. All the Emperor's flattery was unavailing in shaking the faith of this servant of God. She was then put to torture by fire, and a white-hot helmet was placed on her head, but God saved her miraculously and she escaped and left Rome. She began to go from city to city, there to bring the pagan people to the True Faith. In two more cities she was brought before princes and judges, and tortured for her Lord, performing on these occasions great miracles by the power of God and quickly recovering from her wounds. The pagans, as ever, called her miracles magic, and ascribed her recovery to the power and mercy of their pagan gods. Saint Paraskevi once said to a prince who was torturing her: "it is not your gods, O Prince, who heal me, but my Christ, the True God." She was finally beheaded by a Prince Tarasius. Thus gloriously ended the fruitful life of this holy woman. Her holy relics were later taken to Constantinople. She suffered for Christ in the 2nd century. On July 27th Our Holy Orthodox Christian Church commemorates the Holy and Great Martyr Panteleimon of Nicomedia. Born in Nicomedia of a Christian mother, Euvula, and a pagan father, Eustorgius, he studied medicine as a young man. The priest Hermolaus befriended him, instructed him in the Christian faith and baptized him. Panteleimon miraculously healed a blind man whom other doctors had treated in vain: he healed him by the name of Christ and baptized him. From jealousy, the doctors denounced Panteleimon as a Christian, and he went before the pagan Roman Emperor Maximian for judgment. 'He stood before the earthly ruler in the body, but in his mind he stood before the Heavenly King.' He freely declared himself to be a Christian before the Emperor, and, in front of his eyes, healed a paralytic of a long infirmity. This miracle brought many of the pagans to the Christian faith. The Emperor put him to torture, but the Lord appeared to him on several occasions and delivered him whole and uninjured. Then Saint Hermolaus suffered, along with Hermippus and Hermocrates. Condemned to death, Saint Panteleimon knelt in prayer. At that, the executioner gave him a blow on the neck with his sword, and the sword broke as if made of wax. The executioner could not kill him until he had finished his prayer and had himself given the word to behead him. Saint Panteleimon was beheaded under an olive tree, which after that became laden with fruit. 'Panteleimon' means 'all-merciful'. God the All-Merciful received his righteous soul, and glorified him among His greatest Saints, his holy relics remaining incorrupt. 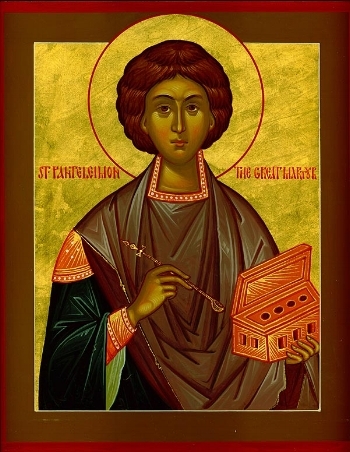 This wonderful holy Martyr suffered with honor as a youth for Christ on July 27th, 304 A.D. Saint Panteleimon is invoked in the prayers at the blessing of water and the blessing of oil (Holy Unction), together with Hermolaus and the other Holy Unmercenaries and Wonderworkers (Miracleworkers). The loveliest church dedicated to him is to be found on the Holy Mountain in Northern Greece.